Back-to-school fashion is the hottest buzz right now, especially with our #CLVGIRLs! As you head back to class, it’s important to have a fresh NEW FALL look to accompany you on your journey this school year so…shopping is a definite must! While you focus on your new everyday outfits just remember…the most important thing that you will shop for (besides your first-day-of-school ensemble) will be your chic homecoming dress! Once your back in school, your homecoming dance will be coming up quick, so you’ll need to be ready! We’re loving this polka-dot cocktail dress above for the girl who wants to make an amazing fashion statement upon arrival, do you love it too?! Our fashion experts at Camille La Vie picked this two-piece party dress with a fully sequined bodice and polka-dot patterned skirt to be your homecoming outfit of choice! Match it with a crystal-embellished box handbag, a chic satin slingback heel and a statement-making bracelet to achieve the ultimate party-girl look of the season! In this dress…you’ll look amazing, feel gorgeous and have a flirty allure that your classmates will adore. 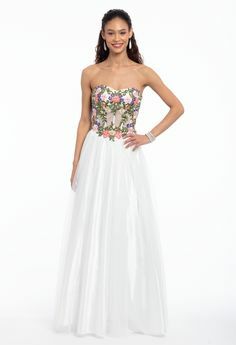 Above all other homecoming dresses this Fall ’15 season, we’re sure this look will be fit for the Homecoming Queen Winner, so shop everything you see here! « ARE YOU A #CLVGIRL ?